The Tower of Babel is lesson 4 in the first quarter of a year of Preschool Bible Study that I assist with on Wednesday evening. Last week we talked about Noah. God told him to build an ark, which is a really big boat. Noah and his family was faithful and did just what God told them to. God saved them from the flood. There were 8 people on the ark. Noah and his wife, Shem, Ham and Japheth and their wives. When Noah and his family and the animals left the ark, God put a rainbow in the sky as His promise that He would never flood the earth again. 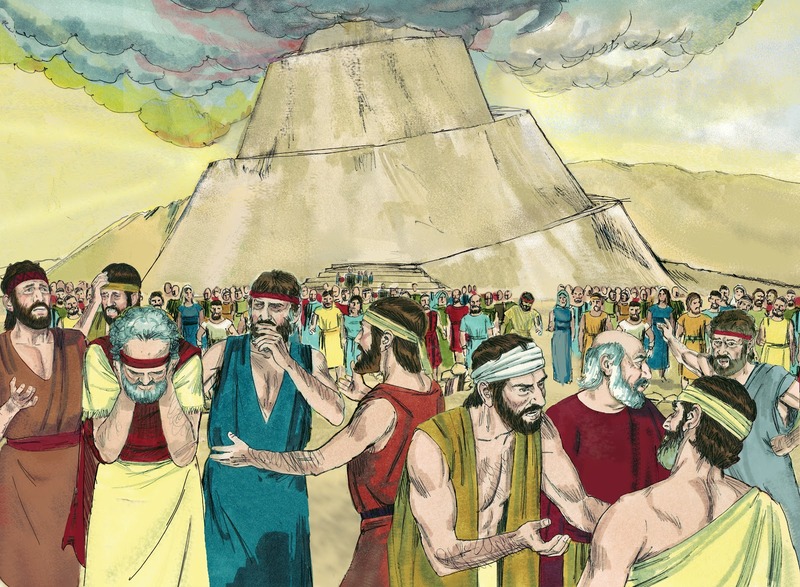 Tonight we are learning about the Tower of Babel. It is found in Genesis (11:1-9), the first book of the Bible. There are 2 parts of the Bible (Old/New Testament) and Genesis is found in the Old Testament. It is about 100 years after the flood and Noah is still alive. There were a lot of people now, instead of just the 8 (Noah’s family) that was saved on the ark. God had told the people to multiply and spread out over all the land. But they just went one direction and lived in one area. The people talked to each other and decided to make bricks and bake them carefully. They said “Let’s build a city with a tower that will reach the heavens. We will make a name for ourselves!” They wanted everyone to know how great they were! But when God saw the city and their tower, He didn’t like what they were doing! They had one language and they were not using it to praise God, they wanted men to praise them for their city! God decided to ‘confuse their language’, that means that now there are all different languages and nobody could understand what the next person was saying! Think about how confusing that would be. “Hey, hand me that brick.” Blah, blah, what are you saying? It made it impossible for them to finish the project, just like God intended. They stopped building the city and they spread out all over the earth. Just like God wanted them to. So the place was called Babel, because God confused the language. They couldn’t understand what their friends were saying! I usually have cards with different languages saying hello, but since one of the teachers speaks Spanish, we had a conversation in the two languages. I do not know what Vicky was saying, but with all the pointing and shoulder shrugging, and "I don't know what you are saying, Vicky! What do you want?" It was a big hit with grins on everyone's faces. 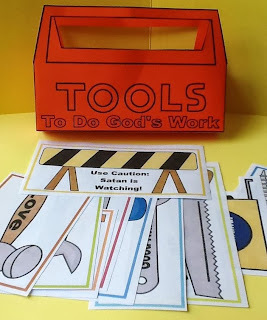 We used this tool box to discuss doing things that God wants. Click here to see more. 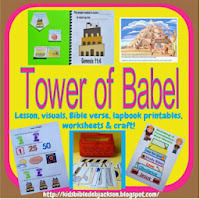 Click here to see some other preschool ideas I did at home (but can be used in a class) for the Tower of Babel. Click here to see the Tower of Babel lesson, ideas and printables for early elementary ages.